Still inspired after my recent experience at the Sustainable Living weekend in Vanwyksdorp, I head off to our own pride and joy of Sustainability - Two Dam Sustainable and Langhoogte Farm - as they say "Schooling since 2015" they farm with Trout, but they do it in the most amazing organic, off-grid, self- sustaining way imaginable. Even the gravel road snaking through the mountains, after I took the Pietersfontein turn-off from the R318, is already a grounding experience and nature becomes more real as you move deeper into this special "hidden" Valley. I arrive at Langhoogte farm, to be greeted by Vivian Harms and her young boy on the hip and their friendly dog. Marco, Vivian's husband, is just busy showing some clients around and once I see them leave with delicious filleted fresh Trout, I already salivate.. You cannot get Fresher than this, but that is not all - as they say in the Ads.. The uncompromised Sustainability in their farming practices impresses me even more. The story of this conscious and committed approach begins in the kloof to the north-west of the farm, where their water supply originates from. What an impressive kloof with a hiking trail leading along and over numerous rock pools ! Here a centrifugal filter was installed and a new pipeline laid for 1.2 kilometres to supply the farm downstream with its necessary water as well as assist in electricity generation. Unlike most water catchment collection points in the area, where almost every drop of water is extracted during dry spells, their filter, through its self-cleaning centrifugal action, releases approximately 15% of its water to continue downstream. This allows the indigenous riparian vegetation along the stream to remain intact, thereby controlling erosion of its banks and subsequent loss of valuable soil. The newly installed pipeline allows for pressure build-up of almost 7 bar, which in turn drives a micro hydro turbine. Thanks to this "high pressure", low water volume' turbine they can generate up to 1 kilowatt continuous electricity which in turn assists their battery bank and takes over some of the electric load at night. Being completely off the main electrical grid and requiring a fair amount of electricity to supply pumps and air blowers for the fish farm, houses and other buildings does have its challenges. Marco shares that all the lights on the farm are LED with remote sensor switches, thereby reducing cabling and more importantly, all appliances are rated as highly energy efficient as possible in their star rating. When Marco takes me to the "Energy Room" I'm speechless - an impressive 22.5Kw photovoltaic panel array on the roof and in the veld feeds into a bank of 48 batteries through inverters and charge controllers, together with the turbine the system delivers the day to day electrical supply for the fish farm and farm buildings. "So what happens on a cloudy day? ", I wanted to know. Marco shows me the LP gas powered generator, which is more efficient and cleaner burning than conventional diesel generators and may briefly take over the load. The Rainbow Trout RAS (Recirculating Aquaculture System) built by the commercial entity of the farm, TWO DAM SUSTAINABLE, also operates sustainably by being an energy efficient low head recirculating system, "which to our knowledge does not exist in commercial aquaculture anywhere in Africa" Marco adds. This design requires comparatively low electricity as opposed to high pressure RAS or high volume raceway cultures, which require and often pollute huge volumes of fresh water. Marco proudly shares: "Our system only requires an average of 15% of its total volume of fresh water per day and cleans, re-oxygenates and recirculates the remaining water continuously 24/7. Waste from the fish is collected in settlement dams to be used as fertilizer for the newly established Pecan Nut plantation downstream, thereby eliminating the need for adding chemical fertilizers. The daily exchanged excess waste water is used for irrigation of the downstream plantation." The Sustainable South African Seafood Initiative (SASSI) a division of the WWF lists South African farmed rainbow trout (Oncorhynchus mykiss) as a sustainable `green-listed' species. Trout are the better alternative for some of the less sustainable fish options, especially those fish stocks threatened by overexploitation in our oceans. Marco adds: "To farm trout in this unique and unconventional manner truly makes them a highly sustainable and on top of that a delicious product." I can confer that Two Dam Sustainable trout is indeed "dam" delicious since I tasted it the first time at Vivian and Marco's stand at the Montagu Makiti Street Market. So it comes as no surprise that their product is in demand with Guesthouses and Hotels as well as Foodies who just have to have this trout on their menu. 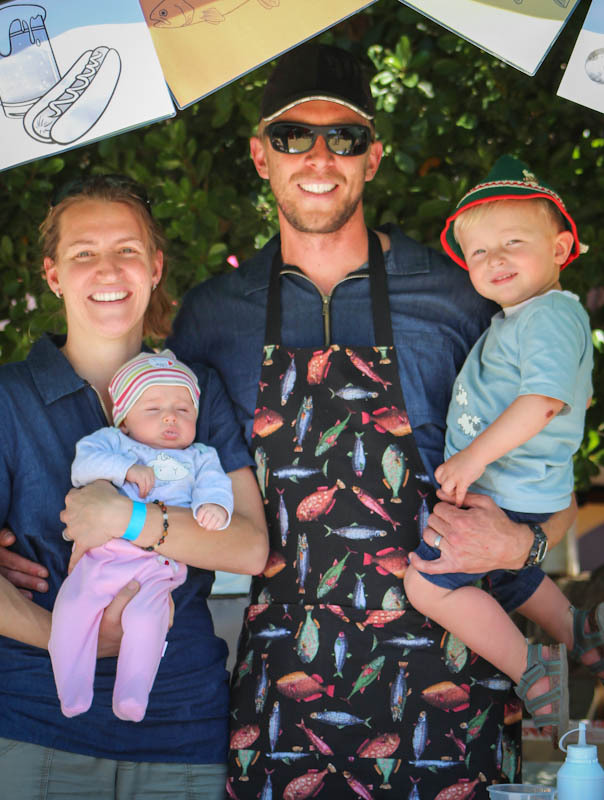 To add to the experience and the provenance of good food - Marco and Vivian invite anyone who wants to visit Langhoogte farm and their Trout farming set up and fish in the stocked two dams. So you can buy your product fresh from its source, or place your order on the phone or order weekly from Tastes of Montagu - for delivery to your door. Orders before every Tuesday are essential as limited stock is kept on site. Take it from me - the silence, beauty and nature of Langhoogte farm would make you want to linger longer and even for that - Marco and Vivian have a solution - a quaint little cottage where you can overnight for a night or two or three. So don't delay - plan a lovely day trip to meet Marco and Vivian or try out their fresh Trout products.